Gaze upon the unending beauty of Noodler's Apache Sunset ink. 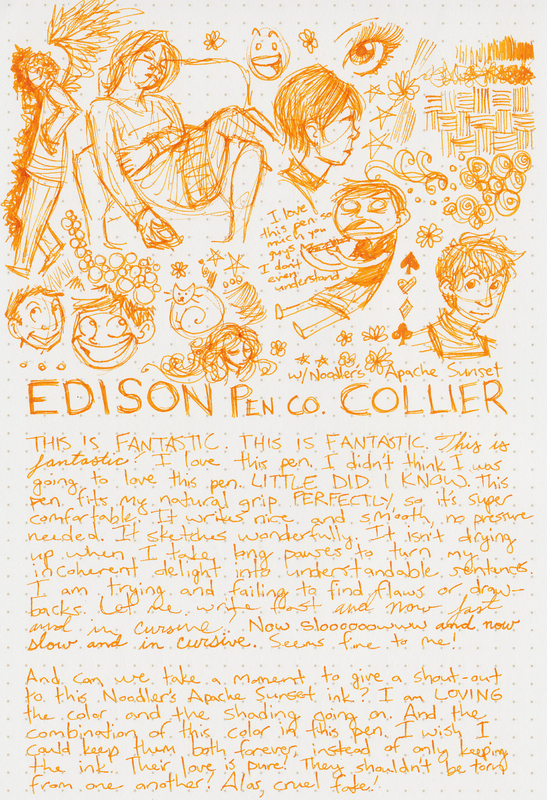 I am so excited about the Edison Collier that I almost can’t put it into words. I figured I would instead elope with this pen to Cancún, and send you all a picture postcard of the two of us writing novels forever on a picturesque beach. But it’s too rainy-looking outside for any of that, so a regular review will have to suffice. In a world where most of my pens come out of a mailer envelope, a pen in a box is like a wealthy business tycoon stepping out of a private jet. Tom Oddo at Goldspot Pens generously offered to let me try out the Edison Collier (and to keep a bottle of Noodler’s Apache Sunset—my choice—as a reminder of the beautiful time shared with this pen); naturally I jumped on the opportunity to try out a new and unknown pen. 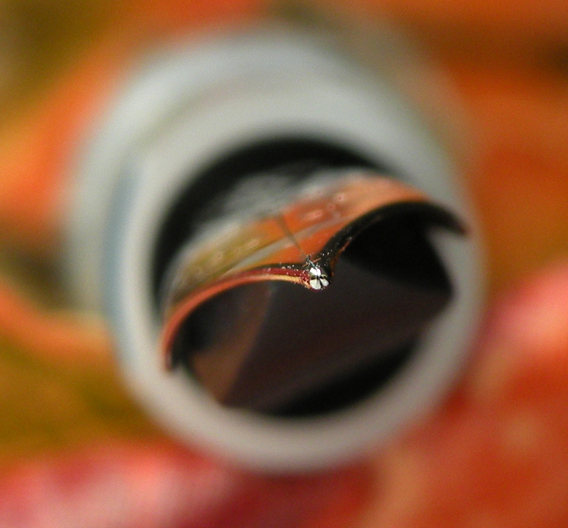 In spite of the deceptive aura of knowledge I may sometimes project, there are many things I don’t know about fountain pens, especially as you reach the upper echelons of quality and fanciness. 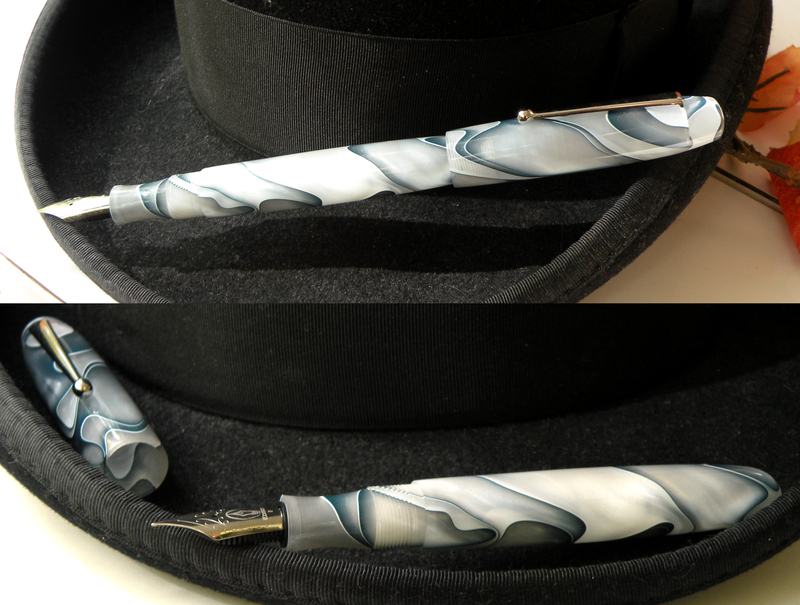 I had not before heard of the Edison Pen Company, and I didn’t necessarily expect for this to be my kind of pen. For one thing, it bore no resemblance to any sort of child’s toy or Japanese spaceship. It looked big. It looked fancy. This pen was probably Out of My League. So I pulled out my top hat, and hoped for the best. I don't kid about top hats. The body: smooth. 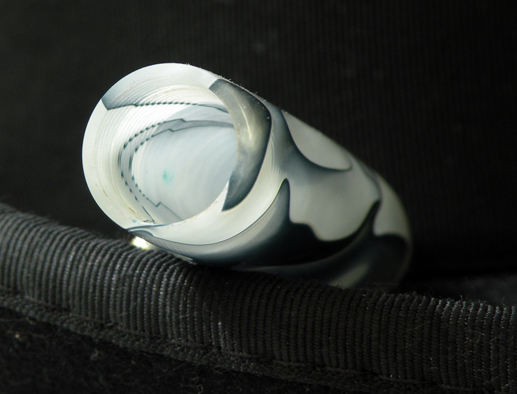 The marbling: mesmerizing. The only labeling is a subtly unobtrusive etching on the barrel, which I admit took me a little while to find. This pen probably qualifies as a miniature nightstick. It is BIG. The only pen I have that’s thicker is the cap of my Rotring Core; the only pen longer is my taper-ended Rotring Art Pen. In a little more than two full revolutions, the cap comes off. You can technically post it, in a sort-of-not-really-this-will-fall-off-the-second-it-touches-anything-else sort of way. With the cap posted, the pen legally qualifies as a miniature baseball bat. Much to my verbally speechless amazement, this pen, this one pen is the only pen I have ever encountered so far that perfectly fits my natural, incorrigibly incorrect manner of gripping a pen. It is as though its creator chopped off my hand in the middle of the night, molded a pen to it, and returned my hand come morning with me being none the wiser. But it’s also comfortable with the proper pliers grip. I’m pretty sure that shimmer you see in the resin is actually captured magic. It is the only explanation for such inexplicable comfort. 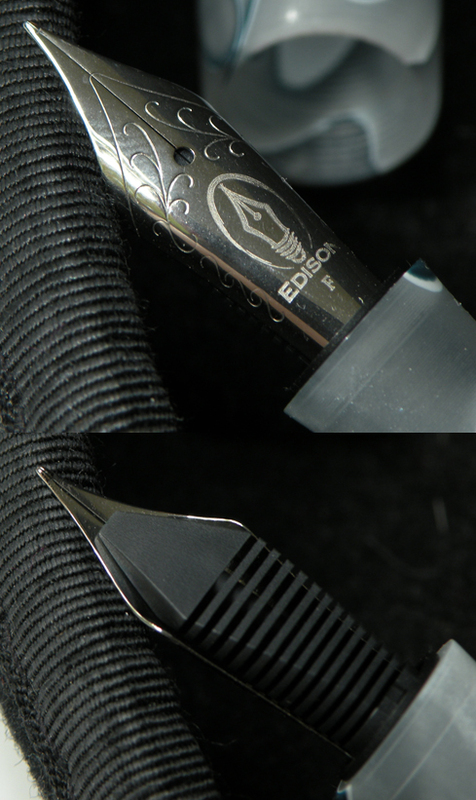 The nib on the model I got to try is, to the best of my knowledge, equal parts steel and wonderful. Every paper I write on is transformed to a plane of joy. 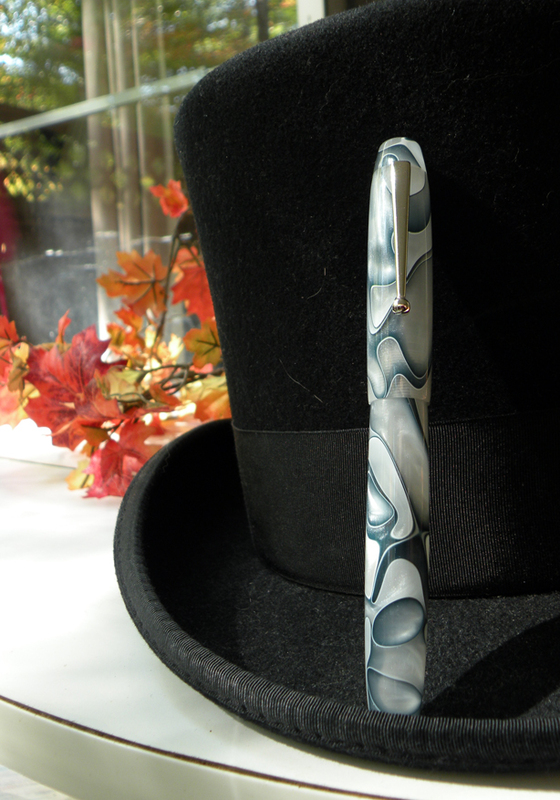 Words, even if I wrote them with this pen, would be insufficient to capture the delight of writing with this pen. This pen has nothing about which I can even begin to complain. There is nothing I can think of that I would improve. Once again, I’d like to thank Tom at Goldspot pens for letting me try this pen, and I’d like to thank Brian Gray of Edison Pen Company for making this pen exist in the first place. Persimmon Swirl — Pen, Paper, Inks…Whatever! Hilarious breakdown of these pens. I love it. 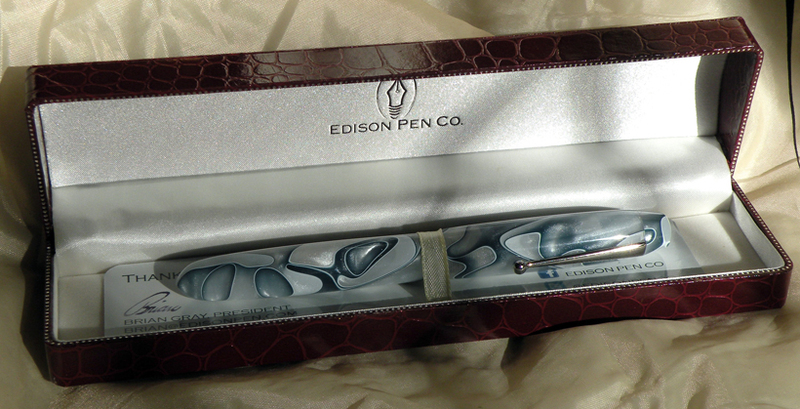 I’m keeping my fingers crossed that Mrs. Claus will put an Edison Hudson in my stocking…. 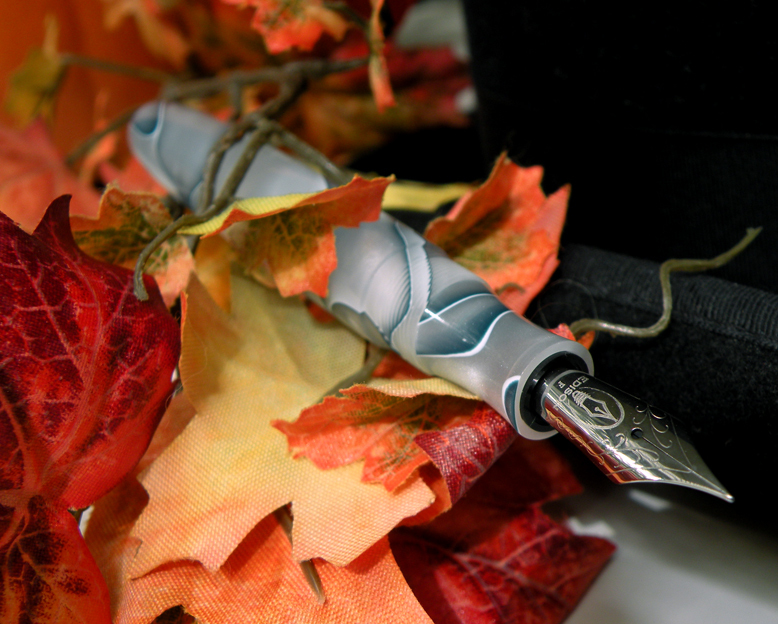 for 180 bucks… still steep, but a better price than the Falcon II… they have the same nib… which is fantastic!!!! !